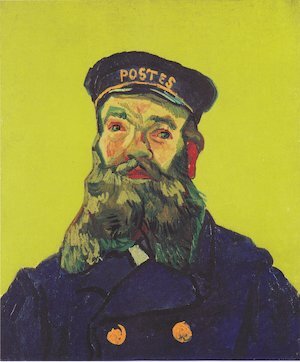 With his bright colours and bold shapes, Van Gogh is an artist whose paintings are both accessible and appealing to children. 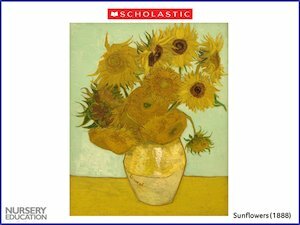 Even young children can try painting and drawing in the style of Van Gogh – and his familiar, everyday subject matter makes a good starting point for a wide range of different activities. 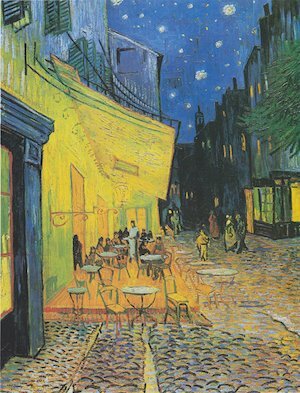 Show the children Van Gogh’s 1888 painting ‘Café Terrace at Night’ in the Slideshow , ‘Van Gogh’s paintings’. Tell the children the name of the painting, and talk about how we know that it’s a night time painting. Look at the tables and chairs, arranged outside the café on the terrace. Can the children spot the customers sitting at the tables, and the waiter with his white apron? Visit a real café with small groups of children, and create your own role play café in your setting – outdoors on the patio if possible. Think of a name for your café and make it attractive with table cloths, small vases of flowers, cups and saucers and napkins. Choose food with a continental flavour, such as cut-up croissants and platters of fruit. Provide white aprons for the waiters and waitresses, a pencil and pad for taking orders and writing bills, play money, a cash till and a tip jar. Put out just a couple of tables so that the café is not overwhelmed. Monitor carefully to make sure no child eats too much and offer every child the chance to be both a waiter and a customer. Can I take your picture, please? It’s good to have some new material. I only wish we had a poster of all the images to look at whilst we talk and do the activities, it’s not practical to have to use the computer for my very young children. So good to get something something brand new. Can’t wait to try out some of these ideas with my Primary 1 class!